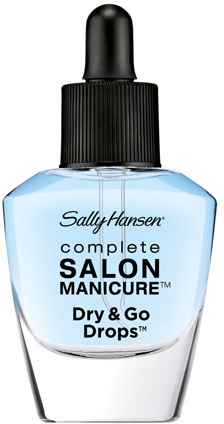 Sally Hansen Salon Manicure Dry & Go Drops is a fast-dry nail polish product that helps prevent smudges and chips. The drops leave nails dry to the touch in 60 seconds and completely dry in less than two minutes. Vitamin E and jojoba formula help to hydrate and nourish dry cuticles. To use, remove cap and replace with dropper. Apply nail colour and topcoat, wait 60 seconds, then apply 1 to 2 drops per nail. This product comes with a dropper which is the best as it allows you to use up the whole bottle and the product doesn't thicken towards the end as others do from putting a brush in and out. After painting my nails I wait 1 minute and then apply 1-2 drops on each nail and it dries my wet nail polish in around 2 minutes and makes my nails look shiny. Sometimes the product goes on my skin around my nails but once I wash my hands it comes off. It's quicker to apply the drops then using a brush so I find it to be very convenient. It's a product that I wish I started using sooner. I highly recommend it. This is amazing! When it comes to nails, I am an OPI addictand have always used the OPI 60sec quick dry drops before and thought they were great BUT.... I ran out and went to chemist and saw the Sally Hansen Dry & Go Drops, I simply bought them as was too lazy to go to the mall and I am so glad that I was as turned out to be the best nail buy I have ever bought and it's cheaper so BONUS YAY ! It claims to dry your nails in 60 seconds and also be great for your cuticles (I wasn't actually thinking about that part when I bought it). I bought for the quick dry as I am hopeless with my nails as somehow I always smudge them and it's always frustrates me, this is way better then the fast dry paint on top coats, I personally think they make no difference but add a good top coat. The dropper for this is great and very simple to use, it seems to smooth out any imperfections and it just makes my cuticles and surrounding skin feel divine! This dried my nails super quick and I didn't smudge them, so that's a bonus. I highly recommend Sally Hansen Dry & Go Drops and I will not be buying any other brand again. P.S. Made my polish stay on longer too. I put 2 - 3 coats of polish on depending on colour so it's nice and thick & opaque, so if you're like me, even though it does do what it says and dries super quick still give it a couple minutes especially if your hopeless and can't help but knock your nails on everything somehow haha. Anyone and everyone especially those with dry cuticles and dry hands. Perfect for sensitive skin as that's what I have and it wonderful. No matter how much time I would leave between painting my nails and going to bed (like up to 6 hours), I would still end up with smudge marks from my sheets. Well, no longer! It claims to dry polish in 60 seconds, and while they are no longer tacky I found it best to take it easy for a bit because they're not completely foolproof yet. The dropper applicator is easy to use, the bottle looks like it is going to last me a long time, and the durability of my nail polish is just as long. Best of all, no sheet marks! I assisted in painting my daughter nails today and is the first time I have used these drops which I have never seen before . The drops come with a cap and dropper in a cute glass 11ml bottle and the liquid is a light opaque blue liquid which has a light pleasant smell and nothing like the nail polish removers. I applied two coats of polish and one coat of top coat , allowing the polish to dry of course between each time . As per instructions , allow about a minute for the top coat to dry then I applied 2 drops per each nail making sure you cover the cuticle. Before you know it the nail turns hard and is dried quite quickly . Amazing item for such a small bottle and is great if you want to dry your nails in a short time span . Make sure you cover the cuticles with the drops to dry evenly . anyone who wants their nails to dry quicker . I have been smudge free for weeks after buying this a while ago. The dropper makes it so easy to apply, and the drops themselves work wonders. The bottle is also really nice. Once you let a drop fall on your nail, the drop spreads so quickly to cover the entire nail. It's really quite fun to watch! Use this for ANY nail polish. It'll change your manicure life forever! Winning! A little bottled wonder. What they claim: Dries polish in 60 seconds! Vitamin E and Jojoba formula helps hydrate and nourish dry cuticles. Gives you a smooth, glossy manicure without the wait. Cuticles look and feel softer and smoother. My first thoughts on viewing the product: I had bought this little bottle months ago and have been using it for manicures ever since. However, it wasn't until I read BH's article "4 things that can instantly ruin your mani " served to remind me I had yet to review this little bottled wonder. It's a small clear glass bottle with a black lid serving as a dropper. The liquid contained inside is a light blue in colour and is very runny. You have no idea what it's really all about until you get inside and use the stuff. Keep on reading! My thoughts on application: Oily! The first time I had used this I followed the instructions on the back of the bottle ("Apply nail colour and top coat. Wait 60 seconds and then apply one to two drops per nail."). The instructions are pretty simple. I waited the prescribed 60 seconds and then touched my nails very gently. My first reaction was, gee this feels quite oily! I was so surprised! I gently pressed the top of the nail and the nail was left with a light impression of my fingerprint, so the nail colour was not immediately dried. So, it does not immediately dry the nail in a minute however what it does is it really speeds the drying process. I don't know how, but it definitely does. The liquid is very runny in consistency, and goes into the sides of the nail to the skin and to your cuticles. What you are left with is definitely a beautiful finish to your manicure. If you have used a high gloss top coat, the Dry & Go Drops seem to add an additional sheen. It's a thing of beauty. I'm down to the last dregs of this bottle. I have enough for maybe one or two more manicures before I need to buy another one. I highly recommend this product and I will absolutely be repurchasing it. Whilst it does not dry your manicure in a minute, it reduces the full drying time to a reliable mere minutes and to me, that in itself is miraculous. I don't follow the adage of less is more when using this product. I use an extra drop for larger nails such as the thumbnail. If I have grown my nails longer than usual I will also use a bit more. After I have waited an extra few minutes, I will rub the oil into the skin around my nails and into my cuticles for some extra conditioning and sit there quite happily letting the product do its magic. Then after a good wait I will wash my hands and moisturise. Those who love a good manicure and/or pedicure but are short on time or patience when it comes to waiting for the polish to dry! Sadly these drying drops are not a holy grail for me. Whilst the convenient applicator was great. I found my nails did not dry in 60s seconds, and my mails smudged when I went back to doing house duties, etc after 10 mins. I actually found my nails dried better with out the drops. I've always wondered about how these work! After reading the last couple of comments about drying times and smudging, I guess it comes down to the brand and ofcourse how many layers you've put on. I used Sally Hansen Complete Salon Manicure plus 3D Gel Shine top coat and my manicure was dry and set (2 layers) after about 5 minutes of using the Dry & Go drops. It's something I need to use everytime I get my nails done, as I'm a very clumsy person and always tend to bump, scratch and chip my new polish right after I get my nails done. It's very runny though, and tends to get dripping everywhere. Best to drip onto your nails over a sink. I was excited to try this as my usual drying drops have been discontinued and I have been looking for a replacement. Unfortunately I'm still looking. The bottle it comes in is very convenient and makes dispensing the drops very easy. The bottle size is generous and allows a number of applications. However, all I found they did was act as an oily barrier on the surface of the nail to prevent anything rubbing on it. If you knock it or touch anything to hard it stills dents or smudges. Drying drops have never been a must in my routine – ain't nobody got time for all the recommended steps! But after receiving Sally Hansen Dry & Go Drops as part of the recent Trial Team I've made a point of using them after every manicure session. You're meant to apply them after your main colour and a top coat and only dispense one to two drops on each nail (depending on their length) to finish off the process. I found the dropper easy and convenient to use, it didn't leak at all and only released the liquid when squeezed. I think this product can be a hit or miss for you, depending on the expectations. It will dry your nail polish within minutes but it won't fully protect it from smudges and marks. If you apply too much pressure or bump the nail against something – you will probably still see a dent or a smear. Same applies to going to bed five minutes after application. However your nails will feel dry to touch almost instantly and will stay nice and shiny as long as you're a bit more careful for about 30 minutes, while the layer under the outer surface sets. I think Sally Hansen Dry & Go drops will work best with thinner nail polish formulas or in conjunction with fast drying top coat. I will continue to use them keeping in mind that I need to look after my nails for some time after application. However if you expect your mani to be fully dry and ready for extreme housework five minutes after using drying drops, you may want to give this product a skip. Thank you Sally Hansen! I often find it frustrating when applying nail polish because it takes so long to do each step and I loathe waiting at the end for nails to dry and not be able to do other things. Even worse is a ding or scratch in freshly painted nails. I wish I had discovered Salon Manicure Dry & Go Drops sooner… The opaque blue formula had minimal scent. After applying a base coat, 2 coats of colour and topcoat it was easy using the glass dropper system to pop 2 Dry & Go drops onto each nail. I applied the topcoat and after finishing my last nail began immediately using the Dry & Go drops. I found popping a tissue below my nails was handy in case of drops running, then drop the product on and as it drops gently roll nail around to ensure even coverage on the nail. I noticed that after I had applied this to each nail they already looked dry and shiny. These drops only took about 1-2 minutes to apply and had worked by the time I finished. With great hesitation I tapped my nail with my finger and could see my nails were already touch dry! Wow, very impressive formula. This really did prevent smudges and dings by applying it after the topcoat and I liked that the Vitamin E and jojoba formula kept my nails and cuticles feeling nourished and not heavy or dried out. Admittedly it seems that this only dried the top area quickly as I did notice it still took about 15 minutes before I could put my nails in water or do anything heavy duty but knowing nails were touch dry and safe from dings was super! I don't like to add fuss into my regime but Dry & Go drops as an extra step actually saved me time and hassle so I'll be sure to keep it as part of my nail polish regime from now on. Roll nail around when applying drops to cover entire nail. Drying nail colours super fast! I applied the nail polish on both hands and then only applied a top coat on one had and not on the other, I wanted to see the difference. The drop & go worked well with nail polish alone. Within a minute or so my nails were hard and dry. When I applied it on the other hand that had the top coat, the nails took one hour to dry and it was still soft and I ended up get dents and smudges on them. So a little disappointed but then not so, being a busy mum sometimes I dont have time to wait for them to dry or apply top coat so I tend to go without nail colour. But with the Drop & Go it sped up the drying process. I was very excited to use this product because i am always in a hurry and hate enduring that 5-10 minute waiting time for my nail polish to dry! The fluid of this product is transparent blue and it comes in a very small, sleek and convenient glass bottle. It has a great dropper applicator which disperses just the right amount onto each nail bed so it is not too messy. The smell is a bit like astringent however fades very quickly. I use this product after my nail polish application and i found that about 1-2 drops does the trick! By the time i finished one hand, my first nail had dried which amazed me!!!! It did not leave any bumps or indents in my nail and I was able to go about my day in less than 3 minutes! Its very fast, works well and great for those on the run! The only time that i have to do my nails is of an evening, before I go to bed. but this means that I inadvertently often wake up with sheet imprints on my manicure. I was so excited to try this to see if it would improve the drying time. Unfortunately it did not. Even though I completed my manicure and applied the drops over 30 minutes before going to bed, I still ended up with sheet imprints on my manicure, meaning that it was not completely dry. It felt dry to touch but have been still not quite set underneath. The drops are super easy to use - just apply 2-3 drops with the eye dropper to your final coat and leave to dry. The liquid is a little oily but doesn't feel to greasy and was not at all unpleasant to use - in fact I quite enjoyed applying it. It is just a shame that i still ended up with a damaged manicure. "Helps" prevent but doesn't really prevent. I'm afraid to say that I'm not convinced that Dry & Go Drops or other quick dry products are particularly effective. I wish that they were the amazing product that they could be as I am always bumping or smearing my nails before they are dry but I find the effects minimal. These Dry & Go Drops come in a cute glass bottle with mini dropper. The dropper makes it quite easy to apply one to two drops to your nails but it takes a bit of practice to find a way to ensure that the drops spread evenly over the whole nail. Sometimes it would all just run to the sides where it would be of no use. I found that if I had applied any of my base coats/colours/top coats a little too thickly and if I hadn't left them to dry long enough that the Dry & Go Drops didn't help. The top coat would appear to be dry but any bump or knock over the next half and hour would reveal that the lower layers were not dry and ruin the manicure. Even if I made sure to apply thinner coats for each layer I found that the drops only sped up the dry time very slightly. The top coat would seem dry if you touched it very lightly but if any pressure was applied it would still dent or smear. The packet says "helps prevent smudges and dings" and it may "help" but it doesn't "prevent". In some ways the product does what it says but it doesn't actually say that it does much. Nothing beats taking your time and letting each coat dry properly before applying the next. Let all lower coats dry completely and only use to dry the very top coat. Keep a tissue or towel handy as it can be messy. I found this to be quite good and lots of fun. Still I did have to be careful for the nail colour to fully dry otherwise I'd get some damage to the nail colour. Put it this way, I couldn't go off straight away and do all the normal busy things that I actively do with my hands. I still had to be a bit mindful that I'd just done my nails. Nevertheless, it does give the nails a boost in the protection stakes from minor bumps which would normally call for a complete re-application. My best tip is to apply this very last of all the products you apply to your nail - like even after the top coat if you are applying one. This is a transparent blue fluid and it comes with a little glass medicine dropper to apply the drops precisely onto the nail. The drop self-disperses and I found two drops better than one. It doesn't have a smell which is a great thing!  I am impatient or usually doing my nails on the run so a product like this is brilliant. The sally Hansen dry and go drops come in a nail polish container with a droper that you open yourself and put in the liquid. The liquid is fine and really runny but the dropper helps to allow prescise application to each nail. The liquid just drops with a squeeze of the rubber top and sits into the nail. The liquid doesn't run and just sits on the nail. The liquid dries instantly on the nails. The colour is transparent blue. To me there is a fragrance almost like a tea tree/ eucalyptus oil but that fades quickly and is only there in large qualities in the bottle. The formula leaves an oily residure on the nails. Its not noticalbe and doesn't smudge. I used this in between nail coats and found that it made the second coat quicker easier and made the nails smooth and soft. I also used this over my nails finished and it made my nails dry super quick within 2 minutes- amazing!! I didn't have any smudges, lumps, bumps or ridges from knocking my nails or becoming impatient and doing things with my hands. You need to still wait a good 2 minutes before you do anything too. As a fan of purple and bright reds ( the colours that smudge bump and notice any mark) this product is a god send. It takes the nails to the next level. This product contains hydrating ingredients to hydrate and nourish cuticles. Vitamin e and jojoba nourish and keep the cuticles soft and smooth. This isn't an essential product but for me Its amazing. Dries my nails quick and smooth. My manicure routine generally goes - turn on the telly, start with the base coat, blog a little, add a layer of colour, blog some more, add another layer, write a review for Beautyheaven, put on the top coat, read some blogs, put some quick dry drops on, wait a minute, wash hands, then start snacking, because let's face it, not eating for about 45 minutes can be very taxing! Joking aside, I generally leave quite a bit of time in between the layers, which means that the nails are dry by the time I start on another layer. As a person who doesn't like to sit around for longer than is necessary, while doing the nails, I really like the concept of quick dry drops for how handy they could be. This comes in a cute glass vial with a little dropper so that you could aim better. While it can help, it certainly doesn't work as well as I'd like it to. I cannot defend myself or do anything once I've applied nail polish. I usually stand around and spend at least 20 minutes waiting for my nails to dry. This product is a revolution! I can't believe I don't already have this in my nail collection. The products comes in a cute glass bottle, remove the cap and attached the dropper. Once you've applied your base, colour and top coat, squeeze a drop of dry to go onto each nail... and voila! dries instantly. It doesn't really have much of a scent once you've got it on your nails. Unless you put the bottle right up to your nose, you'll smell a fruity/lacquer scent. Make sure to moisturise your fingers and hands after application, it does get a little bit dry. Before discovering this miracle product, manicures were an incredibly frustrating exercise for me. I'd have my nails looking absolutely stunning, then invariably I'd bump one of them....arghhhh!! This product is very like a cuticle oil in scent and consistency, it has a screw top dropper lid (very convenient!) to deliver the product. So, once you've applied your base coat, colour and top coat, you wait about 60 seconds, then drop 1 - 2 drops of this product onto each nail. Then, like magic, they're set. I won't say dry, as this is a fairly oily product - I tend to gently massage the excess into my cuticles - it's very conditioning. I have a definite preference for this over some of the spray on nail polish dryers out there! Be somewhat careful when squeezing out the drops onto your nails - it's pretty easy to overdo it, and not a lot of this product is required. Habitual fresh nail polish bumpers and smudgers.